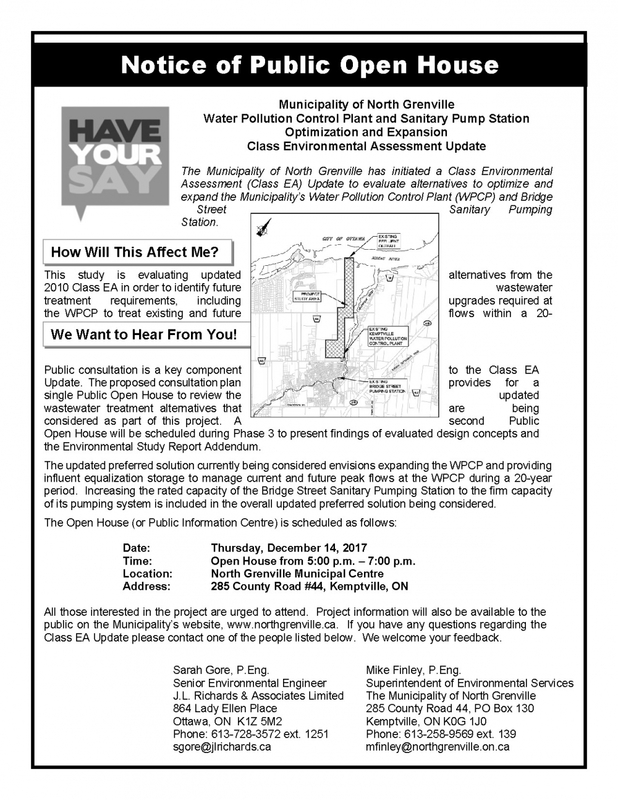 The Municipality of North Grenville has initiated a Class Environmental Assessment (Class EA) Update to evaluate alternatives to optimize and expand the Municipality’s Water Pollution Control Plant (WPCP) and Bridge Street Sanitary Pumping Station. This study is evaluating updated alternatives from the 2010 Class EA in order to identify future wastewater treatment requirements, including upgrades required at the WPCP to treat existing and future flows within a 20-year period. Public consultation is a key component to the Class EA Update. The proposed consultation plan provides for a single Public Open House to review the updated wastewater treatment alternatives that are being considered as part of this project. A second Public Open House will be scheduled during Phase 3 to present findings of evaluated design concepts and the Environmental Study Report Addendum. The updated preferred solution currently being considered envisions expanding the WPCP and providing influent equalization storage to manage current and future peak flows at the WPCP during a 20-year period. Increasing the rated capacity of the Bridge Street Sanitary Pumping Station to the firm capacity of its pumping system is included in the overall updated preferred solution being considered. Time: Open House from 5:00 p.m. – 7:00 p.m.
All those interested in the project are urged to attend. 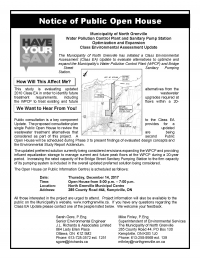 Project information will also be available to the public on the Municipality’s website, www.northgrenville.ca. If you have any questions regarding the Class EA Update please contact one of the people listed below. We welcome your feedback. This study is being conducted according to the requirements of an ESR Addendum under the Municipal Class Environmental Assessment process (October 2000, as amended in 2015).